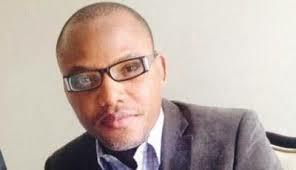 ENUGU – The Department of State Security Service,DSS,Friday,refused to produce Radio Biafra Director,Nnamdi Kanu who was arrested last Monday on his return from United kingdom,arraigned secretly at Magistrate Court,Wuse 11,and granted bail under stringent bail conditions. Nnamdi’s Lawyer,Mr.Egechukwu Obetta,who spoke to Vanguard in his Enugu office Saturday,said,”we have fulfilled his bail conditions. Although the bail conditions were stringent which required the Certificate of Occupancy of a landed property within Abuja municipality, a level 16 officer in the Ministry, which we eventually met in full. “The documents of the landed property was transmitted to the DSS prosecuting counsel by the court clerk. On Friday, we expected that the DSS would have verified the authenticity of the landed property documents. As a matter of practice,the verification does not last beyond 24 hours. As at Friday, DSS did not transmit the verification to the court. “On that same Friday,we brought the situation to the court’s attention upon which the court issued Form 36(FCT) ordering the DSS to produce the prisoner(Nnamdi). The Form 36 was issued by Justice Ahmed Usman Shuaibu dated October 23 ordering DSS to produce the prisoner. “Upon the issuance of this Form 36,the court ordeal went to execute the order but came back unsuccessful. He was unable to produce the prisoner. The DSS latter granted me access to my client who is hale and hearty. He is in good spirit. His condition is very good and has also been granted access to his medical doctor. 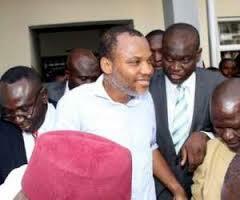 “He(Nnamdi) has instructed me to enjoin his followers to remain calm and be law abiding citizens. The DSS instead of obeying court order to remand my client in prison custody,choose to remand him in their detention facility inorder to stall Form 36 ordering them to produce my client”.